dhb Architects’ striking yet practical Apple Market urban design project in Waterford City Centre was chosen as the Tourism & Hospitality Project of the Year at the 2018 Irish Construction Industry Awards. We caught up with director Maire Henry to find out more about this outstanding achievement in architectural design and what it means to dhb to be amongst the awards yet again. 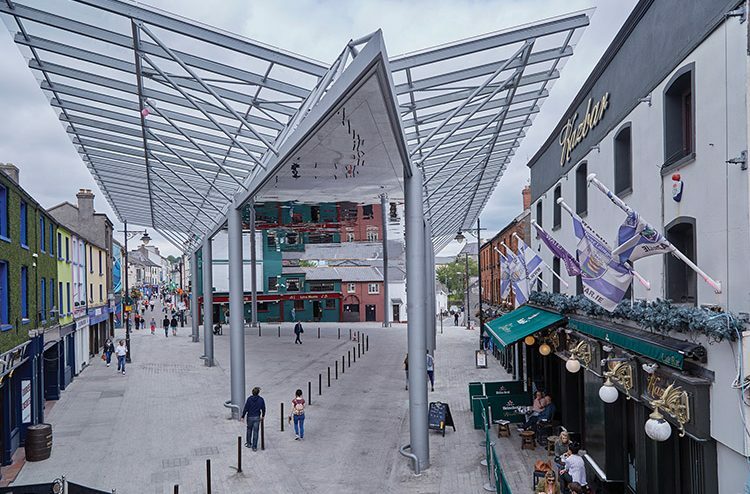 Waterford Public Realm & The Apple Market is the most-recent award-winning urban design project delivered to the very highest standards by dhb Architects. The project comprised the latest phase in the extension of the public realm improvements to all parts of Waterford’s historic city centre. As well as the repaving of some of the city’s most important streets, works included the redesign of The Apple Market. A steel canopy structure provides a covered area for public gatherings and street performance, as well as supporting glazed coverings to the surrounding streets. The canopy features a reflective surface which adds drama to street life, reflecting the activities of the citizens below. For consistency and continuity, the palette of materials used on the ground includes the same pink granite and grey limestone as used in previous regeneration projects in the city. It was hardly a major surprise when The Apple Market beat off strong competition to be named Tourism & Hospitality Project of the Year at the 2018 Irish Construction Industry Awards. “First and foremost, I was very happy for the client, Waterford Council, who trusted us and invested their money into the project,” notes dhb Architects founder / director Maire Henry, who oversaw the project from start to finish. “Waterford Council have a strong track record for investing in public realm projects and this was part of an ongoing regeneration of the streets and squares of Waterford city. For us, and for the client, it was much more than just paving and lights. “Murphy International was a great main contractor. They became as passionate as us about the project and it was terrific working with them. My own design team were brilliant and the contributions of Frank Fox Associates, Nolan Construction Consultants, Douglas Carroll Engineering and Orla Scully, Archaeologist were enormous. It was a really good team and we had a lot of fun working on this project. The Apple Market was for well over a century the marketplace of the city of Waterford. Triangular in shape, it is located along an important route which connected the port to the North with Waterford’s hinterland to the South and West. Bounded on three sides by urban frontages, the area enclosed is approximately 1,500m2. Before this intervention, the area contained a number of bars, shops and restaurants but equally vacant premises and evidence of decay. The space was no longer a market or a place where people gathered. It was cluttered and dominated by traffic and taxi ranks. Not one commercial premises had outdoor seating. There were level changes with kerbs and steps, a mishmash of concrete and asphalt street coverings and a plethora of yellow road markings and signage attempting to order traffic flow. Lighting was poor and pedestrian safety an issue. There existed, however, a community spirit amongst locals who longed for attention to be given to this important space. The transformation of The Apple Market was co-funded by Waterford Council and the European Regional Development Fund through Southern Regional Assembly. The brief required a covered external space or ‘living room’ providing a focus for the restaurants and pubs while extending the enjoyment of city life into the evening time and winter season as well as providing an entry point into the retail spine of the city. In keeping with previous phases of the city’s people-friendly regeneration, the brief included universal access and shared surfaces throughout. The design also had to be a robust and low-maintenance structure but which would be attractive and interactive. The project was won by public tender in August, 2014. Part 8 planning was obtained in June, 2015. Site commenced in October, 2016 and the project was completed in June 2017, on time and within budget. dhb Architects’ response to the site was to roll out a shared surface of stone granite covered by a triangular steel structure. The perimeter of the canopy is glazed to highlight important routes and provide daylight to streets below. The underside is reflective, mirroring the everyday life of the city. This durable, bespoke, opaque reflective material was developed and supplied by local company, Medite in Clonmel. Overall, the imaginative facelift has successfully transformed this space into a major local and tourist attraction. “As the underside of the canopy is made of reflective material, the ceiling captures the life of Waterford city and it has become very popular for selfies,” Maire adds. “The notion of mirrors and reflective material is nothing new in architectural design and it’s something I’ve always had an interest in. I remember being impressed by a sculpture nicknamed ‘The Bean’ in Chicago, which is in the shape of a huge coffee bean and made from reflective material. When I saw it, I was struck by how people are attracted to reflections. I saw other canopies in Barcelona and Marseilles where different things can happen. There are many examples of reflective materials being used to great effect in design, but it had never been done before in Ireland on such a scale. One notable result of the transformation has been a change in the way people use the space. Local traders have taken ownership of the new cityscape and diversified their offerings, making this area more attractive to a wider range of users, particularly families and younger people. The glazed street coverings have encouraged the presence of a sidewalk-type café culture and, once implemented, a new traffic management plan will greatly reduce the number of cars. These are confined to a one-way system set inside the columns of the canopy in order to keep the original street areas free for walkers and coffee tables. The continuation of pub use in the evening and night time means that the space is used almost around the clock, functioning perfectly for a wide range of user-environments. The Apple Market is now a shared surface with all kerbs and steps eliminated. The new ground cover follows the natural gradient of the site and is easily accessible for all. Where possible, steps leading into buildings were removed and replaced with ramped access. The area was once entirely given over to cars: two-way traffic around its edges and a taxi rank in the middle. Now it is mainly pedestrian on a shared-surfaces basis and based on the needs of people of all ages and ability. It is a democratic space which facilitates the order and interactions of urban life in a safe way. The space – a key part of the ancient roots of the city – has been decluttered with the removal of redundant lighting, signage and road markings. The new columns for the canopy provide supports for the new lighting scheme. New bicycle parking areas have been provided. There is a new management team made up of local traders and the Council which oversees maintenance and the organization of events. dhb Architects is a design-led, RIAI-registered practice based in Waterford city. Established in 2004, they provide full architectural design services from concept to completion for all types of projects. Their recent portfolio includes residential, education, healthcare, civic, religious, urban design and retrofit projects. Qualified conservation architects, with an emphasis on sustainable design, their work is mainly in Ireland but they also have completed projects in France, Finland and Spain. All stages of architectural design are provided from conception to completion, including feasibility studies, planning applications, project management, etc. dhb Architects have delivered numerous high-profile projects across various sectors including Mount Melleray Abbey, Waterford Health Park, Bruff House, Pembrokestown Coach House, Gaelscoil Eanna, Viking Triangle Waterford City, WIDA Respite Care Centre, Waterford City Hall Gallery, Wexford County Offices, Giants Causeway Visitors Centre. They have also been engaged to design public realm regeneration projects in Tramore, Kilkenny and Dublin. “We have a small team with four architects and one architectural technologist. For most of The Apple Mart, it was myself plus one other architect working on the day-to-day running of the project, with help from our colleagues. We have a small, open-plan office with a lot of team-work and collaboration. Architecture is a form of art, though, so the job satisfaction derived must be immense? “You take a lot from it but the difference between ourselves and artists is that our pieces have to be lived in. They are subject to buildings control regulations and budgets – it’s quite a challenge not to lose your design when you take all of these things into consideration.